CCP Groot here, one of the Game Designers on EVE: Valkyrie. I’m here to chat to you a little about the Ultras system introduced in Valkyrie’s new Warzone expansion. Ultras are a feature in Warzone that allow players to unleash a powerful offensive, defensive or tactical ability. These are typically a ship’s most characteristic ability, with each Ultra ability being specific to a ship. For example, when the Nagi’s “Radiant Burst” Ultra is used, it sends out a pulse that repairs the hull of any friendly ship in range. This ability can be used in clutch situations to turn the tide of battle, such as repairing a teammate who is delivering the relic in Extraction Mode, or repairing your squad during a trench run in Carrier Assault. These high impact abilities help to define a ship’s strength and playstyle. They have been designed to add an additional tactical layer to Warzone. They’re not always a ship’s most powerful ability, but they synergize well with other ships’ Ultras and abilities. We want Ultras to encourage teamwork, as well as provide players with more opportunities to create ‘wow’ moments. When used correctly, they will help pilots to shape the flow of battle. Ultras are split into two categories, active and single use. Single use Ultras are designed to be activated once before they are either used up or destroyed. For example, when the Scarab’s “Void Storm” Ultra is used, it deploys an EMP bomb. After a set duration indicated by a beeping sound effect, it will detonate. Any ship caught in the blast will be EMP’ed, which will stun them, taking the propulsion and weapon systems offline. Now, active Ultras modify the state of the pilot’s ship, weapon or ability upon activation. The Strix’s “Plasma Vents” Ultra removes the Pulse Cannon’s overheat penalty. For the duration of the Ultra, this allows the Strix to continuously fire without the weapon overheating. Once fully charged, players can make use of their Ultra. To deploy it, players need to press the assigned Ultra-input. Once pressed, if the ship’s Ultra is single use, then it will be activated at that moment. However, if the Ultra is an active ability, then pressing the Ultra input will activate its effect for a set duration. As Ultras are powerful abilities, players won’t receive them straight away. As implied above, before an Ultra can be used, it must first be charged. There are two methods of charging an Ultra, passively and actively. Players don’t need to do anything to passively charge there Ultra, it charges during battle until the Ultra gauge is full. However, pilots can actively charge their Ultras by collecting Salvage. Salvage is represented in-world as purple flashing shards that are dropped by opposing ships when they’re destroyed in battle. As a player collects Salvage, it will reduce the cooldown of their Ultra. Collecting Salvage also reduces the cooldown of all your team’s Ultras, but, at a fraction of the amount that is applied to the pilot’s own cooldown. When an Ultra is fully charged, a message appears on the HUD informing the player. Players can see the charge status of their Ultra in their ship’s cockpit. The Ultra’s HUD is represented by a purple globe. This globe fills up, and when full, it pulses to inform the player that their Ultra is ready. As each Ultra is unique, progress earned towards an Ultra is reset if a player switches ships. This applies both when a user changes ship or class, for example, switching between a Wraith and a Jackal, or a Banshee and a Scarab. Both these instances would cause the Ultra’s progress to be reset. This includes both partial progress and an Ultra that is ready to use. The key reason for this is that we want to prevent players cheating or exploiting Ultras. To give an example, we don’t want players to use the Wraith to build up an Ultra charge and then quickly switch to the Shadow so that they can drop a “Violent Whisper”, which has the potential to take out more targets than the Wraith’s “Mjolnir”. This is just an overview of the Ultras system. 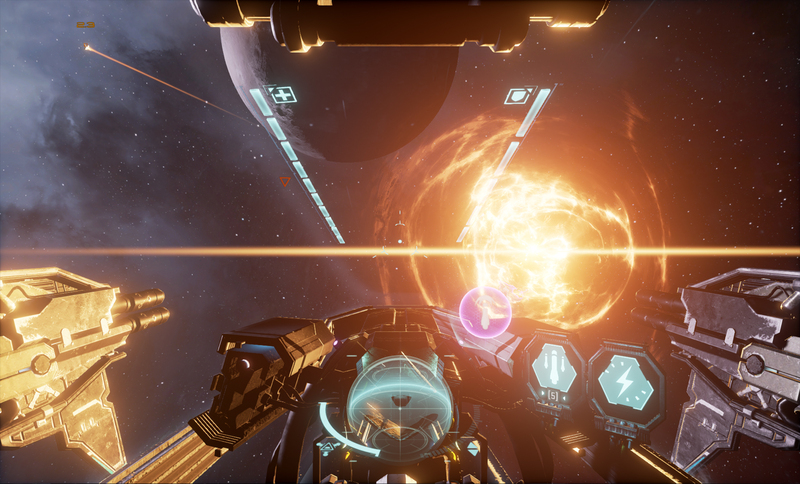 Stay tuned for upcoming dev blogs in the next few weeks for more information on EVE: Valkyrie - Warzone.